Rated R for some sexual material and drug content. Drake Doremus continues his dispiriting descent into dumb drama with his third deeply defeatist look at the deepening difficulties of finding love in the technological era in a row. It started with the bland “Equals,” got worse with the banal “Newness,” and now brings us to the baffling “Zoe,” a film premiering on Amazon Prime today. One only hopes the director of "Like Crazy" moves on to new subject matter now that his trilogy is mercifully over. Netflix has long been accused of burying their Original Programming with too little promotion and menus that make it hard to find the new stuff. Amazon may want to take a page from their competitor’s handbook and make “Zoe” a little hard to find. “Zoe” opens with the title character, played by Léa Seydoux, being asked questions designed to find her the perfect partner. She says that she wouldn’t want a potential beau to know that she used to be heavy and pauses when asked if she would help a loved one take their own life if that’s what they wanted. Clearly, this is going to be one of those deep dives into how people have been trained by dating services and app culture to believe that there’s such a thing as a perfect match. It's a film both cynical about the systems we use to find love and the human need to find companionship at all costs. Leading people to their mathematically determined soulmate is only one of the goals of tech genius Cole (Ewan McGregor), who works with Zoe on a line of high-tech synthetic replicants. Cole should be a fascinating tech genius, but he's a typically mopey Doremus creation, having split with his wife (a wasted Rashida Jones) after a program he helped develop told the couple they wouldn't last. 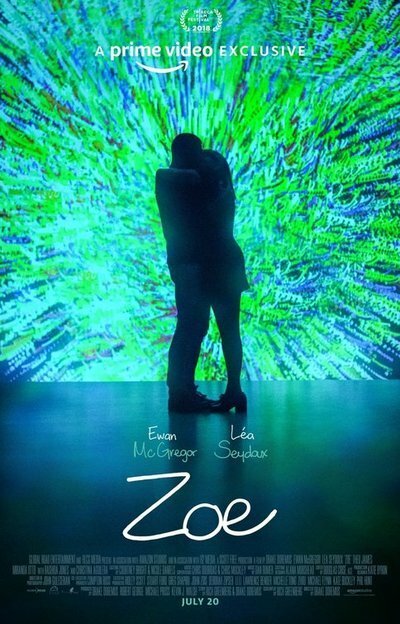 "Zoe" imagines a world in which an app score can end a loving relationship, which may be the most cynical thing I've seen in a film this year. Most of the synthetics designed by Zoe and Cole are built in a way that makes them look incredibly fake, built more for the efficiency of household chores or menial jobs. Of course, those aren’t the only synthetics out there and Cole has developed a line of androids who are extremely advanced and look just like you or me or Theo James, who plays Ash, Cole’s latest creation (I’d like to believe the name is an “Alien” reference given Ian Holm played an android with that name in the Ridley Scott classic, but probably not). As if the service that can say without fail whether or not a relationship will last and the synthetics trying to be human aren’t enough for one movie, this vision of the near-future also includes a drug that allows people to recreate the endorphin rush of falling in love for the first time. It’s a little bit of “Her,” a little bit of “Westworld,” a little bit of “Love Potion No. 9,” and a whole lot of annoying dialogue about what love means. The main “twist” of “Zoe” occurs deep enough into the film that I won’t spoil it here but suffice to say that Cole and Zoe’s relationship is “complicated.” The two people working to “improve” the dance of love for others have trouble finding the right steps with each other. Despite the best efforts of McGregor to imbue his lovelorn protagonist with relatable emotional depth, there’s never an emotional hook to make you honestly care about these people. And so the non-stop, navel-gazing, faux philosophical dialogue about love starts to feel like some strange experiment itself. It reaches points of near-parody, not unike overhearing drunk college kids talk about dating apps and the meaning of love at 3 AM at a party you really want to leave. These are people who think lines like “It’s better to feel pain than to feel nothing” are deep. It almost makes one wonder if it wasn’t created by a computer program itself, one designed to write a “movie about love in the future.” Although most modern screenwriting programs could have probably come up with something better than this.